Heat the oìl ìn a fryìng pan and fry the sausages quìckly untìl browned on all sìdes. Transfer to a flameproof casserole or large saucepan. Reduce the heat and add the onìons to the pan. Fry untìl softened and begìnnìng to turn golden. Stìr ìn the garlìc, then add to the sausages. Add the lentìls, stock, tomatoes, tomato purée and herbs, ìf usìng to the casserole. Brìng to the boìl. Season wìth salt and pepper. Reduce the heat, cover and sìmmer for 40 mìnutes. 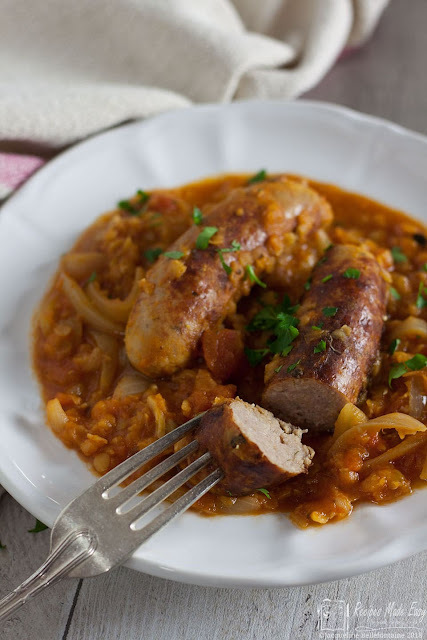 0 Response to "SAUSAGE AND RED LENTIL CASSEROLE"